There is very easy experiment to understand the concept of heat transfer to a solid body. 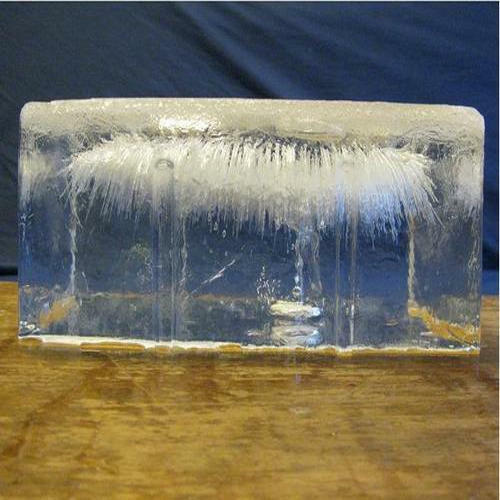 Take a small ice cube from the refrigerator and a big block of ice from ice factory and put them in the same room. You may have even noticed it before. Which one do you think will melt first? Any ice melts by absorbing heat from its surroundings. That raises up its temperature above the melting point. And then ice starts to melt. The rate of heat transfer to both the bodies of ice - ice cube and ice block - is expressed with the same equation. In the above equation, U and ΔT are the same in case of ice cube and ice block. Only the surface area is different. It is quite clear then, the the rate of heat transfer is directly proportional to the surface area of the body. BUT, the large block of ice has a much larger surface area then the small ice cube. Then why doesn’t the large block melt faster? The large block does absorb heat at a faster pace. But all that heat is distributed across a large volume of ice. On the other hand the small ice cube has a very small volume that needs to be heated up. In fact if you take the ratio of (surface area / volume) ice cube has a much larger area / volume ratio, than the ice block. Correspondingly, the temperature of the cube rises faster and it melts faster. Heat transfer rate is directly proportional to the 'available surface area' for heat transfer. BUT the effect of that heat transfer also depends on the volume. Generally, it is better to consider the (surface area / volume) ratio when designing a heat transfer system.